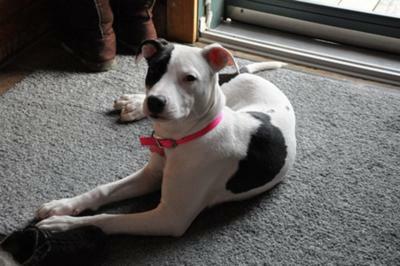 My pit bull named Skyy is 7 months old. We met feb 17th at the West Kennebunk animal Shelter in Maine. I have always had Dobermans and lost my last one Chloee 2 years ago. It took me that long to get over her. Now that I have Skyy makes me realize I waited too long. We do everything together! Her favorite thing to do is cuddle. She loves walks on the beach and loves to play with everyone and every dog cat etc she runs into. Skyy is one of the best things that has happened to me in a long time and has certainly stole my heart I seriously do not think I could love her more than I do now. I actually have to thank the tv show "Pit Bulls and Parolees" for choosing Skyy! Getting a new dog does not mean that you are replacing your lost dog. But there is a void in our human lives when they die. Our human routine is centered around them, and around the children. Or just around adult routines, and them. We have structure in our lives. If the dog happens to die suddenly (as was with us - not from old age), then the need to fill that hole in the household is strong as well.